An isolated, utterly forgotten trail from a bygone era that climbs to an epic vista of the Trinity Divide and Trinity Alps. This is one of the few trails on the west side of the Trinity Divide. The Trinity Alps from Blue Divide Point. 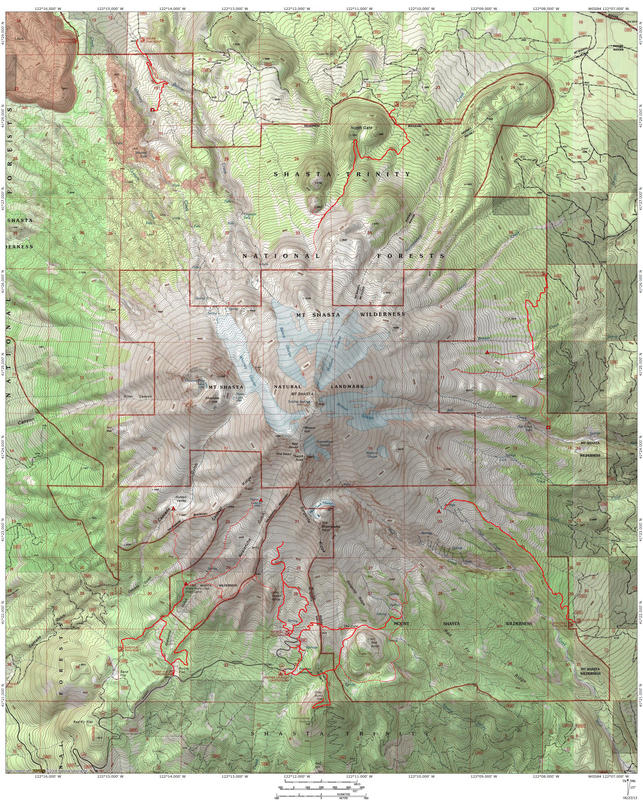 The Trinity Divide, the high mountain range that lies immediately west of Mount Shasta, is something of a split personality. While its high country has the best paved road access of any of the Klamath Mountains’ subranges, much of the higher territory is far more forsaken and unvisited than many of the subrange’s harder-to-get-to regions. Not entirely unrelated, another reflection of the Trinity Divide’s dual natures is the difference between its eastern and western slopes. The east side of the range is, for the most part, a cohesive block of wild and undeveloped land. Some roads have penetrated here but use has been kept to a minimum and the mountains are generally left in a primitive state beyond the edge of the road. The west side is much different. 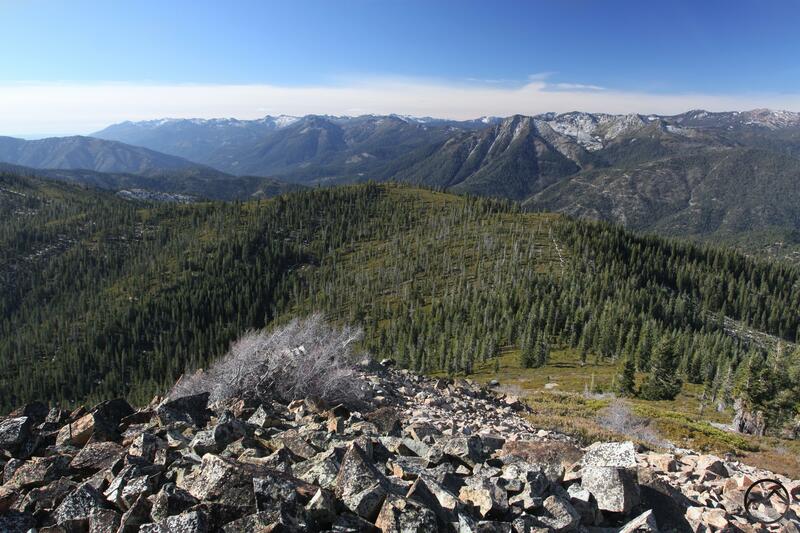 Due to the checkerboard nature of the land ownership (a legacy of the 19th century’s railroading) the western slope of the Trinity Divide has experienced heavy logging in the past. These two manifestations of the range’s split personality has resulted in the west side of the Trinity Divide being completely ignored by hikers and others looking to enjoy the great beauty of this side of the range. This is a sad thing since the west side has some great scenery and offers some stunning views while at the same time yields incredible solitude for those who are willing to explore it. Mount Shasta and the Trinity Divide from Blue Divide Point. One of the best ways to experience the western slope of the Trinity Divide is to hike the utterly forgotten and abandoned Blue Divide Trail. This trail, built many, many decades ago, has long since been left derelict, a relic of an earlier age when trails were more abundant on this side of the Trinity Divide. Now it receives almost no use whatsoever, the domain of a very occasional hunter or cartographic junkie. What hikers are missing is a very scenic hike through seldom travelled mountains to one of the best vistas in the Trinity Divide. Most of the Divide is visible, with the unusual perspective of seeing it from the west rather than the more typical east. Mount Shasta looms like a giant high above. 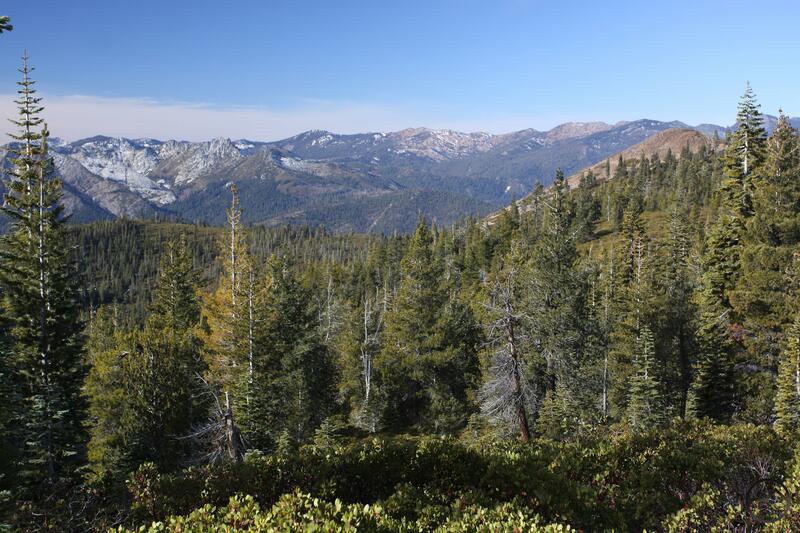 What really sets the view apart from others in the area is the proximity to the expansive Trinity Alps. Just a few miles to the west, the chaotic jumble of granite and serpentine lines the horizon like the teeth of logger’s saw, cutting away at the blue sky. It is an awe-inspiring sight and one that can be had for a very easy effort. For those seeking quiet and solitude, contemplation at the Blue Divide’s amazing vista will surely satisfy. Mumbo Peak from the road hike. Before arriving at the Blue Divide Trail proper, it is necessary to hike nearly 2 miles on a dirt road. Fortunately the road is gated so traffic, if any at all, is minimal. Furthermore, the forest cover is sparse along this section of road so it is open and offers great views of its own. It is 0.15 miles from the parking clearing to a gate that blocks the road. One can either park at the clearing, where it is easier to turn around, or park at the gate. It is important not to block the road and it is harder to turn vehicles around at the gate so the clearing is a preferable place to leave vehicles. From the gate, hike north on the road. Stay right at the first fork after 0.2 miles. Proceed 0.3 miles further and stay left at a second fork. The slope rising precipitously on the right climbs up to the summit of Mumbo Peak, the highest peak on the west side of the Trinity Divide. Most of the range’s highest peaks lie along the crest or radiate out to the east along the great central rib that culminates in the amazing Castle Crags. Beyond the second fork the road turns to the west and begins a moderate climb. Views to the southwest toward Mumbo Creek’s canyon and Bonanza King Mountain are good. 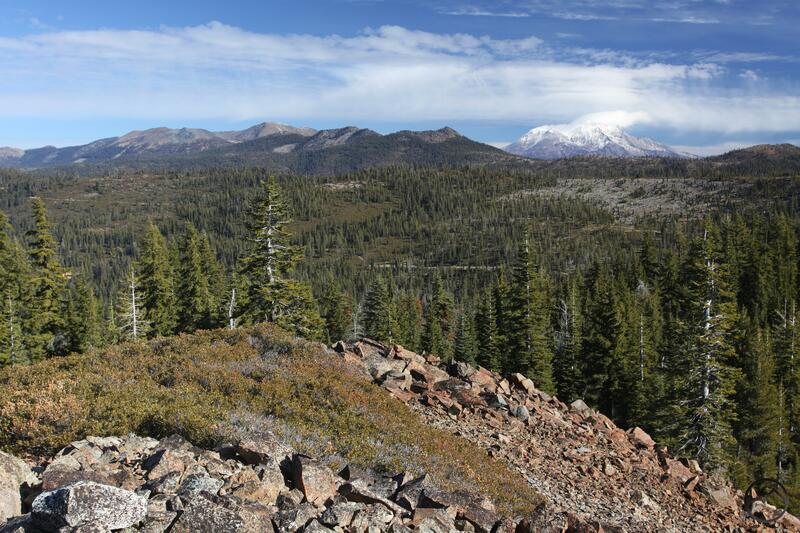 As the trail climbs Mumbo Peak in its entirety comes into view and Mount Shasta just begins to become visible, poking out from behind the Trinity Divide’s crest. A taste of things to come from the beginning of the trail. After 1.6 miles from the gate, the road makes a hairpin turn, reorienting northward. There is almost no tree cover along this section of the road and since it begins to follow a short ridge, the views in most directions are great, going a long way to help hikers forget they are still on a road rather than a great alpine trail. As the road climbs Mount Eddy and Mount Shasta become increasingly visible. The road levels off after climbing for 0.3 miles up the very moderate grade. This is the crux of the hike. There are no markers to indicate the time to get off the road and find the Blue Divide Trail proper. It is difficult to describe this section, though, when on the ground, it is not as hard as it sounds. At the top of the climb the road begins to turn back to the east and there is an area where it is mostly brush with great views. Just before the brushy area there is a clearing on the left side of the road where there are small piles of logging detritus and stumps. Jump off the road here. If you continue on the road to the brushy area with good views, you have gone too far! The author built a few cairns to mark this point. Again, locating the right place to get off the road is the hardest part of the whole trip. Once in the clearing there is a faint, though wide, skidder track that cuts back to the southwest. Cairns were built to mark this area too. If on the right course, this track should make a short jaunt to the southwest for 100 yards or so. A short, rounded knoll should be kept on the hiker’s right. Good views of the Trinity Alps will soon come. Note the large rocky prominence just a short distance to the west. This is the destination of the Blue Divide Trail. To find the trail, look for a wide trail cutting through brush that branches due west off of the skidder track. A yellow sign in the middle of the trail marks the edge of private property and the beginning of federal land. Note that the sign is located in a wide swath cleared out of the brush to mark the boundary between private and public property. 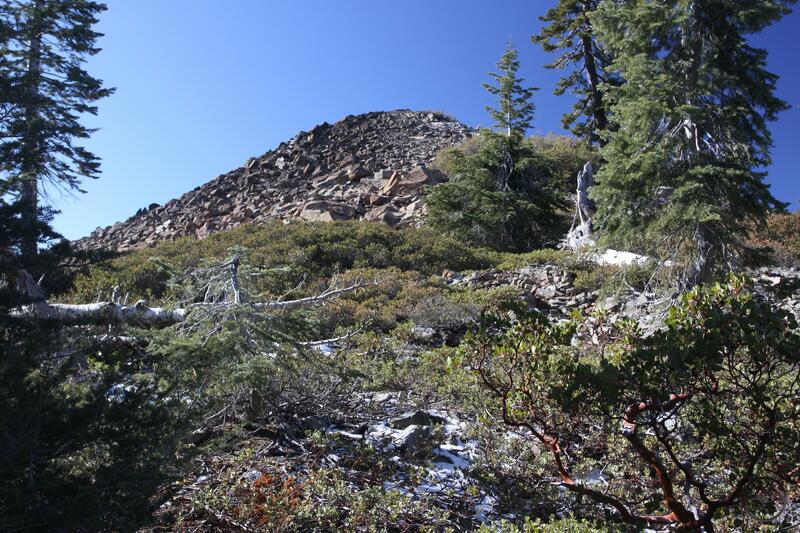 If hikers missed the trail but manage to locate the boundary clearing, they can follow it until they encounter the path. The path runs perpendicular to the boundary clearing. 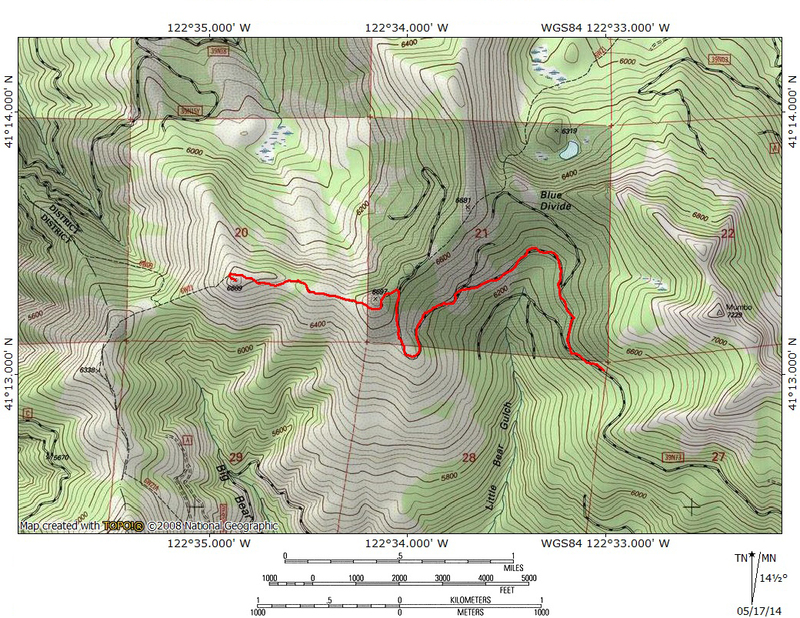 It is helpful to study the satellite image of this area before attempting the hike. Old trail through the scree. Once having located the trail proper, the hard part is over. The trail, though narrow, is obvious the rest of the way. It initially descends nearly 150 feet as it heads west. Once it levels off, the path generally passes through pinemat manzanita. Unlike the road, there is some sporadic tree cover along this stretch of trail. 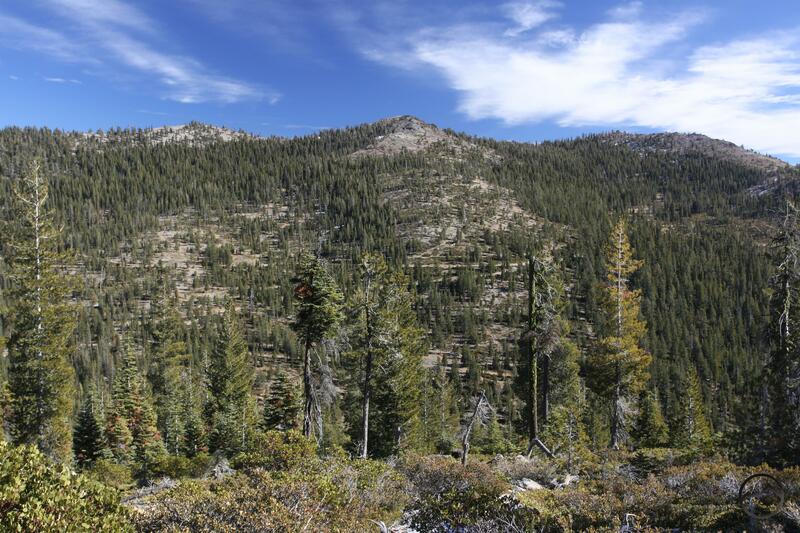 Consequently the views are limited, though the Trinity Alps are still obvious in many places. 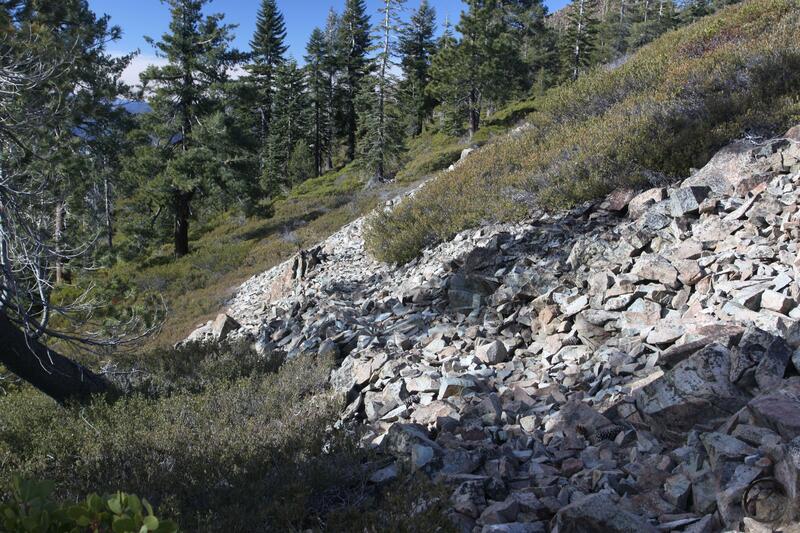 At one point the trail passes through a sizable scree field. The trail is constructed through the loose rock, dipping a little to avoid some brush. Sections like this are evidence that the trail was engineered at some point in the past, rather than just being a narrow use trail. About 0.2 miles after the trail has levelled off it begins a short climb, gaining about 80 feet in 0.1 miles. The path again levels off and maintains its westerly course for another 0.2 miles until it arrives at the large rocky prominence that is the trails destination. For the purposes of this page, this little peak has been unofficially dubbed Blue Divide Point. To reach the summit, it is simply a matter of scrambling up the loose rock to the summit. It is not a long or difficult climb but the loose scree does demand a bit of caution. Once on the top, an incredible 360 degree vista unfolds. To the south hulking Bonanza King gazes down on the long Trinity River Canyon. Red Mountain and the craggy Grey Rocks mark the southern end of the Trinity Divide. To the east, the crest of the Divide runs the entire length of the horizon, capped by numerous peaks including Many Lakes Mountain, Porcupine Peak and massive Mount Eddy. The opportunity to observe Eddy’s giant cliffs that tower above the Deadfall Basin is a unique perspective on the large mountain. High over all of this presides the crowning majesty of Mount Shasta, tall enough to rise well above the crest of the Trinity Divide. To the north China Mountain, South China Mountain and Cory Peak highlight the long ridge of the Scott Mountains, marking the headwaters of the Trinity River. Yet, as grand as all of this is, the highlight of the view from Blue Divide Point is the view to the west. The epic expanse of the Trinity Alps, the largest and wildest mountain range in the North State seems like it is just a stones through away. It nearly is. The Bear Lakes Basin, one of the grandest corners of the Trinity Alps is only 5.5 miles away from Blue Divide Point, separated by the steep, 3,500 foot drop into the Trinity River Canyon. Many of the high peaks of the Trinities are visible, including Thompson Peak, Sawtooth Peak, Gibson Peak and a host of other jagged summits. All of it is so close it seems as though the few people who make it to this point can reach out and grab it all for themselves. In some ways they can, since the solitude here is so all-encompassing, it does feel like this whole area is a private domain. It should be noted that the Blue Divide Trail is still extant beyond Blue Divide Point. However, the views are not as good and there is no clear destination beyond the vista. For those looking for a longer hike or more remote country to explore, this is an interesting endeavor. From the town of Mt. Shasta, head west on W. Lake, crossing over I-5. At the stop sign, turn left onto Old Stage Road. After 0.25 miles, veer right onto WA Barr Road. Continue south, crossing over the dam that impounds the Sacramento River and forms Lake Siskiyou. At the intersection with Castle Lake Road, stay straight. The road becomes Forest Road 26. Follow this road for nearly 12 miles. A signed fork indicates Gumboot Lake is 0.5 miles to the left. Continue to the right, climbing up the cirque that contains the Gumboot Lakes. Immediately past the PCT Gumboot Trailhead turn right onto Forest Road 39N73. Proceed for 2 miles on the dirt road to a very large, obvious clearing. Continue on foot along the road for 0.15 miles to the gate and beyond, climbing to the Blue Divide Trail proper. Was this a recent visit? Thanks, sounds like a good adventure. It is. It is so isolated out in that corner of the Divide and the views are great. It is a nice change of pace. May 5 2015 Several deadfalls partly obstruct the road into the gate but were passable. There is a large deadfall near the trail to the “peak”. I did not take the trail, just went a little beyond the last deadfall which is immense and required a short bushwack with my dog to get past. Views were worth the trip. Next time I will leave sooner and go farther.